More of my macaron binge Hazelnut Citrus Stone Fruit (orange/apricot/cherry) Macarons with dark chocolate ganache filling. See here for the French recipe I used for making macarons it has full instructions and many links to macaron resources. I used citrus/stone fruit 'herbal tea' powder (1/2 tsp of each flavour orange, apricot and cherry) to colour and flavour the hazelnut macaron shells. The hazelnuts leave nice little speckles in the shell I used half almond meal and half hazelnut meal. I did 1" sized (exactly the same size as an Australian 20 cent piece) shells and found that 50grams of egg whites makes 50 shells over 2 dozen macarons!!! I used flavoured 'tea' powders to colour/flavour the macarons. These are available in the tea section of the supermarket. They are in a mixed pack of 'herbal' teas that contains pure cherry, pure apricot, pure mint, pure lemongrass and pure orange (they have no actual tea in the ingredient list). This is an easy and cheap way to include a strong flavour base to the macaron shell. 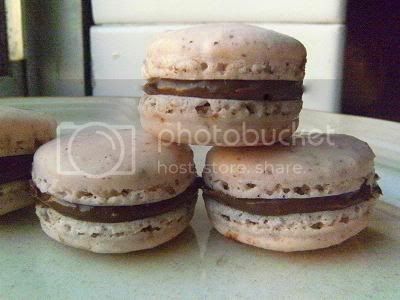 Grind the dry tea powder along with the nut meal to fully incorparate it into the macaron mixture. Looks fabulous. I am so enjoying your macaron posts. They look perfect! I tried once and failed horribly. Would love to try again soon. Wonderful macarons ! Thanks for your lovely comments on daring cooks. Fantastic and always so perfect! Kudos! Where do you get your citrus powder from? These sound great! Oh my dear Audax I am so sorry I did not come before but I was sick. I Love all you did since I don't visit your blog, really love your macarons they look so tall and beautiful and the spanish rice looks delicious,I can smell the "sofrito" which is something we use in my country every day when we cook. HAPPY BLOGG-AVERSARY (belated) I am so happy of being a reader of your blogg and thank you for letting me visit you here where I see so many delicious dishes. These look so delicious. I've bookmarked this page, really want to try to make them :). Audax, I am totally inspired to make my own batch of macarons! You Rock!! Mmmmmmmm. Hazelnut macs are my favorites. I wish I could buy those marvellous teas hear, in Spain, but I'm afraid it's gonna be a little difficult to find. I just can't get over all the macarons you make and each one better than the next! I so want to catch up with you even if it takes me all year. These tea powders sound intriguing and I wonder if I could find them where I am. Beautiful beautiful macarons. Your macarons look so cute and delicious! Thanks for sharing your recipe! You really are on a macaron roll aren't you? These look lovely too! I haven't gotten around to making any new ones and will be leaving this weekend for three weeks, so it will have to wait untill I am back. Macarons..something that I have failed at repeatedly! Aud, your macarons are looking more and more stunning each time I stop by..although your first round looked perfect! I'm amazed at the flavor combos you come up with (using tea powders to flavor mac shells is brill! - and I LOVE the stone fruit filling, as well as the chocolate mint below) , whether it be a baking or cooking challenge. I think I may need some feedback from you regarding the next DB "fill in the blank' challenge, as I'm at a roadblock flavor wise. I'm fusing and need your opinion! Ciao Audax ! I've never dared to bake macarons but your are such a delight !!! Thanks for the comment on my blog, I always love your daring cooks/bakers creations. These macarons look awesome too, so neat and pretty! All of your macarons are so beautiful! I hope you do a post of the ten dozen wedding macarons! That will be an amazing sight to behold!!! Good Luck!!! Your macarons are looking more and more beautiful each time I stop by! Thanks for your blog and sharing your knowledge. I love the idea of using flavoured 'tea' powders to colour/flavour the macarons. You really are so clever and such a wealth of information. I love the sound of 'pure'. I stupidly bought some dehydrated raspberries from Simon Johnson at a high price as I wanted to try raspberry macarons (not there yet - but soon!!!). I'm sure the pure tea flavours will be perfect. Thanks for the comment on my blog and you are quite right about the first comment which I have now deleted I have just been a bit busy so hadn't taken enough notice, 6 year old birthday has had priority ! oh my god...36 layers..u r a pro. i just have one question...my cakes are fluffy n taste great but the icing just won't stay...i do not use butter cream,n am averse to using too much confec. sugar to make that icing hold its shape...help plz! and THAT'S the way it's done!! !